Damage caused by the storm in Ronda. 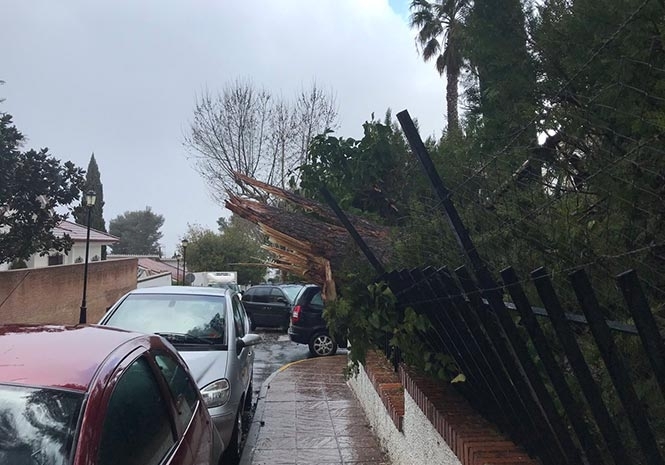 MALAGA is braced for a second buffeting after Storm Emma swept the region. It comes as the provincial office of state weather agency AEMET confirmed that it has upgraded warnings for strong winds and rain to orange from midnight until 3pm tomorrow. Forecasts suggest that torrential rain will bring up to 80 litres of water per square metre to the Costa del Sol, Guadalhorce Valley and Malaga City. A second yellow warning is in place for Ronda, where 20 litres per square metre could fall in a single hour. Axarquia and the Serrania de Ronda bore the brunt of today’s weather chaos, with 64 litres per square metre in Benamargosa, 50.8 in La Viñuela 45.6 in Alcaucin, and 46 in Pujerra. There are no reports of serious injuries, but an articulated lorry was blown over by gale force winds near the Benahavis exit of the A-7 motorway, sparking a seven-kilometre tailback. A total of eight flights to Malaga Airport were diverted elsewhere as 90 kilometre per hour blasts of wind made landing dangerous. A woman was hurt by a falling palm in Fuengirola, while the coast guard was called to help a stricken yacht off Marbella. In Malaga City, a palm tree fell onto calle Bolivia near the Baños del Carmen, which were themselves flooded as the coast was battered by three metre waves. Baños del Carmen, Malaga City. Three people were trapped in a car in Velez-Malaga and the Guadalhorce River broke its banks in Villanueva del Rosario, flooding several roads. The Andalucian branch of the 112 emergency services helpline says it has managed more than 831 incidents in the last 24 hours after Sevilla and Cadiz were badly hit by the storm. The normally dry stretch of the Guadalmedina River in Malaga City.